Ok, we all have had turkey cooked many ways. When I came up with this idea I was at the meat counter at a local Albertsons looking to pick up some beef ribs. As luck would have it, they had none. In a last ditch effort to salvage a day of vacation I intended to apply to a new video I decided to do something with a turkey that involved injecting and maybe the idea of stuffing it with something other then traditional stuffing. As I turned around I was look at the Asian food isle. That's when it hit me. "Kung Pao chicken" would be a great stuffing for inside the turkey breasts. That said the rest was history. Clean 1 large or 2 small chicken breasts (1lbs.) and then cut into strips. Dust the strips with Jack's Old South Hickory dry rub and place the strips on the smoker @ 230 degrees until browed. Chop 1 garlic clove and cut about three slices of red bell pepper then cut it into 1/4 inch pieces. Cut green onion into 1 1/2 inch long pieces. Make your cuts at an angle to produce a nicer looking cut veggie. Break about 8 Pecans in half length wise. 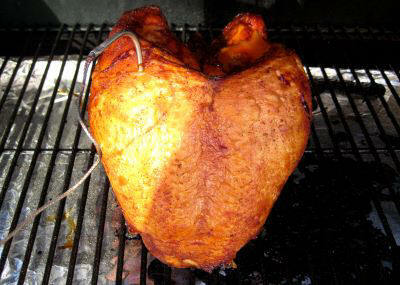 Once the chicken has browned, remove it from the smoker. In a large wok or skillet, add 2 tsp cooking oil and heat the pan. Once the pan is hot add in the veggies and stir them frequently as they cook. After about a couple minutes add in the chicken meat and Kung Pao chicken sauce. Then add the pecans. Simmer a couple minutes then remove from heat and let cool. Once the Kung Pao chicken has cooled it's time to get to stuffing the turkey. Trim off all the excess skin hanging off the turkey. Make sure to rinse the turkey as well. Using a shark steak knife, cut a 2" wide opening at the top front of each breast. In a sawing motion work the knife to the rear and down opening up a good sized pocket inside the breast. Be careful not to breach the exterior of the breasts as we want to keep the Kung Pao chicken and its juices inside during the smoke. In a small deep bowl mix 1 Tsp rub, 4 Tbsp melted butter and 1/3 cup Teriyaki sauce. Stir this up good. 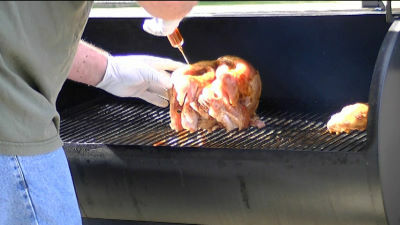 Using a mop, work the sauce into and all around the inside of each breast cavity. The remaining sauce will be used for injecting later. 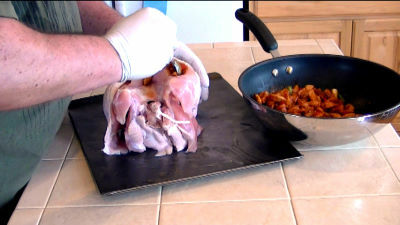 Using a large soup spoon begin scooping the Kung Pao chicken into the breast cavities. As they fill you will need to use your fingers to push and work the filling deep into the breasts. You should be able to get it all inside the breasts. Once the turkey is stuffed, rinse the excess sauce off the turkey. Apply a good amount of Jack's Old South Hickory dry rub to the exterior of the turkey. Once the dry rub has been applied, start coating the exterior with some brown sugar. Patting it on seems to work the best. Now take the left over teriyaki and butter sauce and using a flavor injector, inject it into each breast. To inject properly insert the needle all the way into the breast. 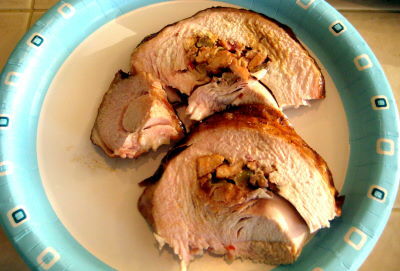 Try to stay within the turkey meat without getting into the inner cavity of each breast. Push the plunger until you feel pressure then slowly withdraw the needle as you continue to depress the plunger. You ant to maintain the same pressure all the way out. This will provide for maximum flavor injection. Do this in several places within the breasts. 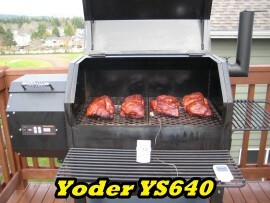 Now that the turkey is loaded and seasoned it's time to apply the smoke. Place it in the middle of your smoker grate and smoke it @ 230 degrees until the internal temperature of the breasts reach 168 degrees. Be careful that your temperature probe does not hit any bones as this will cause an inaccurate reading. Once the turkey reaches 168 degrees, pull the turkey and let it stand for at least 20 minutes before carving. This allows for the internal juices to redistribute and give you an opportunity to throw a pan of biscuits on to your grill. There is nothing like biscuits baked on a grill and served with hot butter and raspberry jelly. Once the turkey has cooled a bit using a sharp knife or electric knife remove the entire breast in one piece from each side of the carcass. Lay the breast inside down and cut across the grain into 1/2 inch slices. Plate up the slices with biscuits and maybe some beans or sweat potatoes. 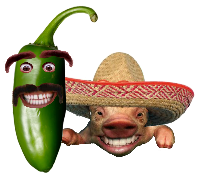 The flavor will be amazing and the meat will be juicy and tender. 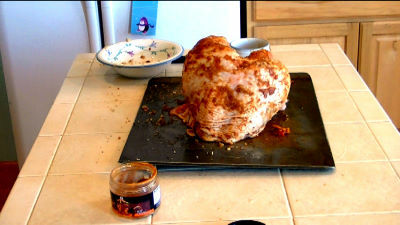 After this smoke my daughter's comments were "this was the best turkey she has ever eaten." That says it all right there.